I’m really not sure why crack actually exists when something like pumpkin spice peanut butter chocolate chip granola is possible. I mean really. 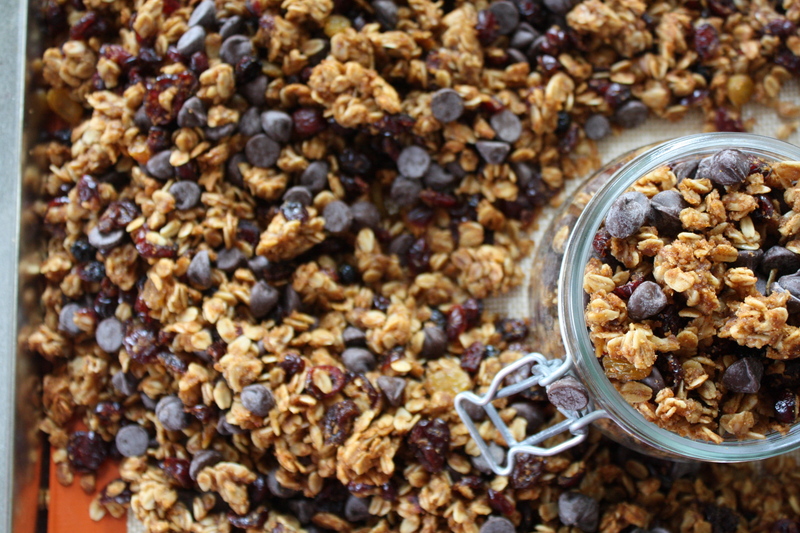 This granola is as good as its name is long. It was gone in a few short days. Yup. Just a few days. 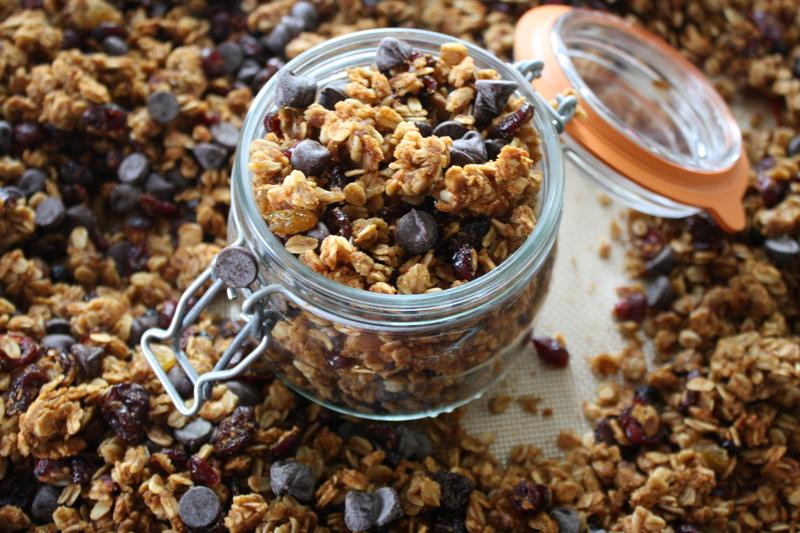 Once you try this granola though, you’ll see why it left the house as quickly as it came in. A dear friend from school recently sent me a canister of macadamia nut white chocolate granola from whole foods. It was heaven. Heaven I tell you! Not only was it sweet, chewy, and soft, it was also gluten- free. Similar to this granola, it was gone in less than 48 hours. 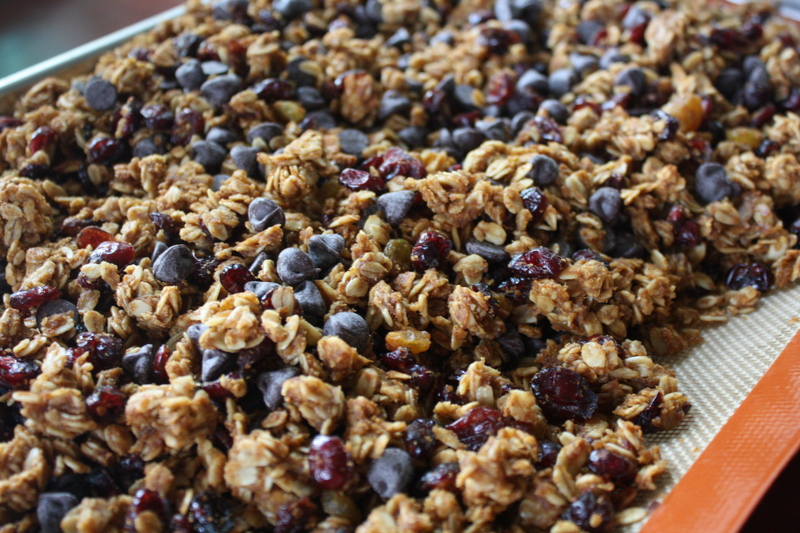 I knew I had to keep getting my delicious granola fix and luckily, I stumbled upon this recipe on pinterest. It is super easy and so delicious. It just takes a few easy steps and some rather simple ingredients (most you probably already have!). Before you know it, your house will smell like fall!! 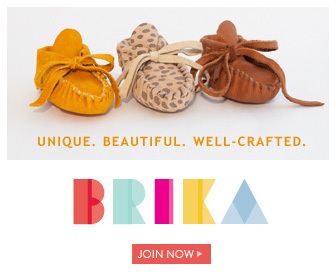 Now if nothing else convinced you to make this, that should. However, I do not recommend making this when the heat index is 104 outside. You will have a rather grumpy fiance when your house thermostat reaches 82 and beads of sweat start forming even on your dog. A 300 degree oven should probably be reserved for the cooler days. Lesson learned! *Note: this recipe is very adaptable! Use what you have! You can also add whatever extras you’d like, such as adding nuts or seeds. You can also swap out the dried fruit for any that you’d like. The chocolate chips can also be swapped out for white chocolate, peanut butter, or butterscotch chips. You choose! Preheat oven to 300 degrees. Line a large baking sheet with a Silpat liner or parchment paper. You can also heavily coat the baking sheet with cooking spray. Using an electric mixer, whisk together the pumpkin, peanut butter, agave, brown sugar, coconut oil, molasses, vanilla extract, and all spices. Mix well until combined. Add the oats and stir to to completely coat the oats. 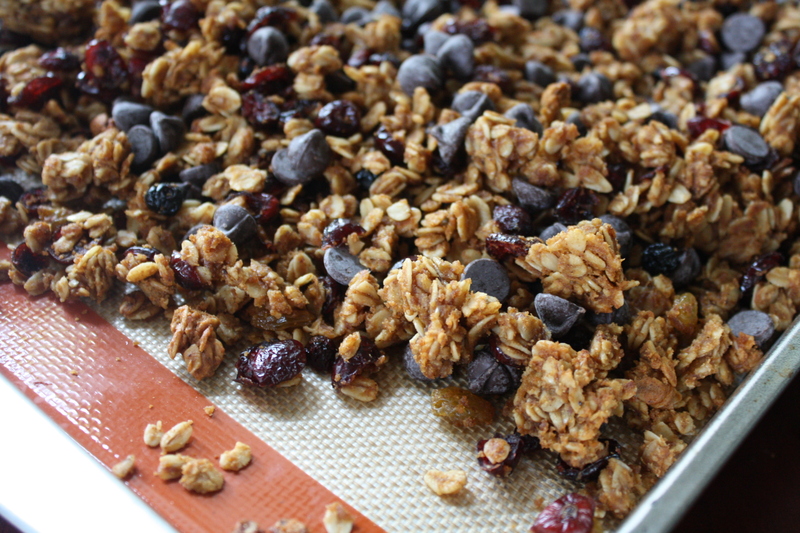 Pour the oat mixture on the baking sheet, making an even layer. Do not pack the oats down onto the baking sheet. Just loosely place it on there. Bake for 20 minutes. Remove baking sheet from oven, “fluff” the oat mixture. Add the dried fruit and mix. Return the pan to the oven and cook for an additional 20-25 minutes. Remove baking sheet from oven and let cool. 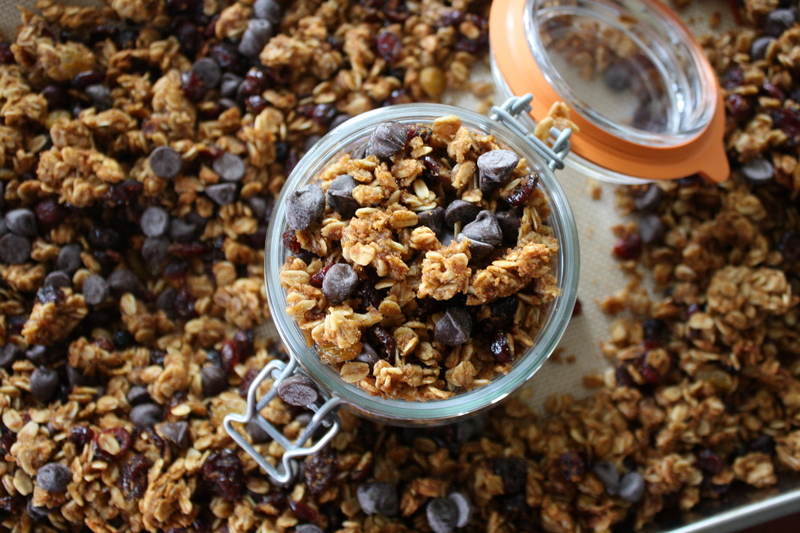 Add the chocolate chips once the granola is COMPLETELY cool. Sprinkle on greek yogurt, enjoy it as a cereal, or just eat it plain! 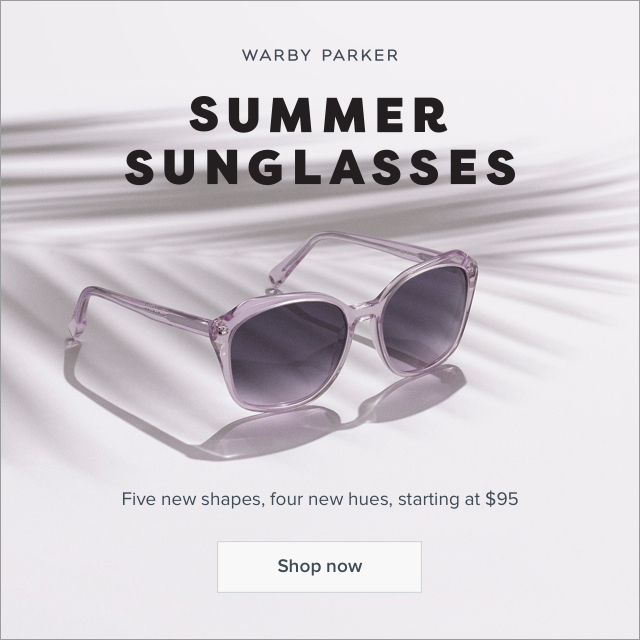 It’s also a perfect gift for a neighbor! Enjoy this guys! And happy almost-fall! Thanks for trying my recipe. I’m glad you liked it.